Here you will find different exhaust wrapping for your exhaust system! 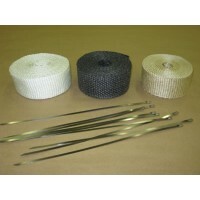 Exhaust wrap kit, 2" wide x 25 ft. long roll. One roll does approximately 4 ft of pipe with 1/4" to ..